Please join the Prison Public Memory Project and Historic Hudson for “IF THESE WALLS COULD TALK…” an exploration of life inside the New York State Training School for Girls (1904-1975) in Hudson, NY, part of Path Through History weekend, June 8th and 9th. Main events will include an art installation inside several rooms at the Dr. Oliver Bronson House, a National Historic Landmark, which, beginning in the 1920’s, served as a superintendent’s residence, staff social space, and work site for the girls incarcerated at the Training School. The installation draws from a rich variety of historical documents and images from local collections and national sources to provide a fascinating glimpse into the stories of several young women kept at the Hudson Training School, including a young Ella Fitzgerald. 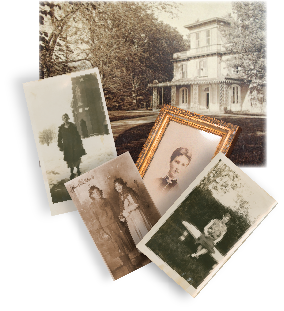 We would like to thank Hudson resident and business owner Lisa Durfee for her gracious permission to use historical materials in her collection for the development of the art installation. And thanks to the superintendent and staff of the Hudson Correctional Facility for their support of the event. intersection of routes 82, 9, and 9H, continue on Route 9 towards Hudson. Previous postDelinquent Girls Need to Farm Next postWhere is Margo Bake? If you could, please contact my father, Michael Antonelli. If memory serves correctly, his mother, Mary Fletcher, worked at the Training School for Girls in Hudson. Mary has since passed away, but my father might have some stories. Thanks for letting us know about your father. We’d love to contact him about Mary Fletcher, her experiences at, and any memories he has of the Girls Training School in Hudson. We’ve e-mailed you and look forward to hearing from you soon.